Government inspectors are checking food makers who use protein concentrates to make sure none of the contaminated protein concentrates to make sure none of the contaminated products found in pet foods have reached other products, the FDA said. The announcement came as pet food manufacturer Menu Foods expanded its recall because of possible cross-contamination between melamine-tainted products and other foods made in the same period. More than 100 brands of pet food have been recalled since March 16 because they were contaminated with melamine. An unknown number of dogs and cats have been sickened or died after eating chemical-laced pet food. A list of the newly recalled products is available in this release from Menu Foods. A complete list of the recalled products along with product codes, descriptions and production dates is available here. Here are answers to consumer questions regarding the recall. Q: What brands and types of pet food are being recalled? A: The recall of tainted pet foods has been slowly expanding for more than a month. Initially just wet and canned foods were on the list. Now at least one dry cat food and several treats for both cats and dogs have been added. Check the FDA Web site for the full list of recalled brands. Menu Foods, a major manufacturer of more than 100 store- and major-brand pet foods, announced the first recall March 16. The company has since expanded its original recall to include a broader range of dates and varieties. At least five other companies have also announced recalls of foods and treats made with the contaminated ingredient. How many animals have been affected? The number of confirmed pet deaths remains at roughly 15, although anecdotal reports suggest hundreds of pets may have died. Cats appear to have been especially susceptible to the contamination. The ingredient's importer says none of the contaminated wheat gluten went to manufacturers of food for humans. Q: What should I do if I have some of this pet food in my cupboard? A: The FDA says stop feeding it to your pet. 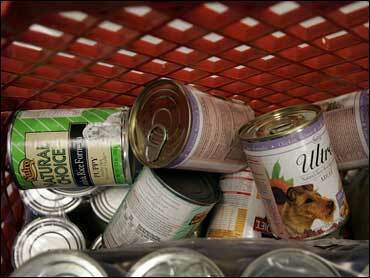 Many of the major store chains are also granting refunds for returned food. Q. How do I know if my pet is sick as a result of eating contaminated food? What are the symptoms? A: Signs of kidney failure include loss of appetite, lethargy and vomiting. Q. What should I do if I already gave some of this food to my pet? Do I need to take my pet to a doctor? A: It's best to seek advice from a veterinarian in such situations, according to the FDA. Q. Who can I call with questions? A: Menu Foods has a consumer hot line at 1-866-463-6738 and 1-866-895-2708. The FDA is asking those with sick or dead pets to call FDA state complaint coordinators. A list of contacts for such coordinators is available at http://www.fda.gov/opacom/backgrounders/complain.html.